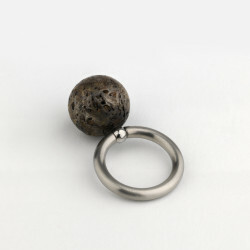 Stainless steel ring with a half-sphere hanging from a socket joint. Hemisphere constructed from fine silver and 8001. Fine silver foil crumpled and compressed, spaces filled completely with tool-silver and rolled out to form sheet. Marbled pattern revealed through heat-oxidisation. Ring part from solid stainless-steel rod, ends hollowed out to form socket. Ball with stem turned and soldered into sphere. Both parts hold under tension. Hemisphere, Elisabeth Holder, 1987, Crafts Council Collection: J192. Photo: Todd-White Art Photography.